Sporting events are popular and fans look forward to their favorite teams competing, so it is big news when two companies combine their expertise to bring sports to a huge global footprint. Asia Satellite Telecommunications Company Limited (AsiaSat) and Encompass Digital Media (Asia) Pte. Ltd. (Encompass) are partners and will provide Telekom Malaysia Berhad (TM) with C-band capacity on the AsiaSat 5 satellite to deliver live coverage of the 29th Southeast Asian (SEA) Games to viewers across Asia-Pacific. 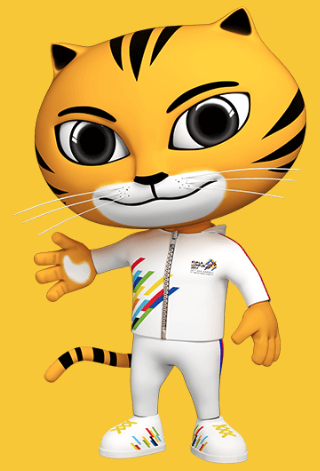 Kuala Lumpur 2017's mascot, RIMAU, is inspired by the graceful and powerful Malayan Tiger. RIMAU stands for Respect, Integrity, Move, Attitude and Unity. The biennial sporting event invites teams from 11 nations in Southeast Asia to compete in multi-sport games, held in Kuala Lumpur, Malaysia, from August 19th to 30th. AsiaSat 5 will be an integral part of the satellite and fiber networks for the delivery of the event. The events and games will be transmitted from all venues to the International Broadcasting Center (IBC). From there, the feeds will be delivered to broadcasters across the satellite’s extensive footprint, spanning from Russia to New Zealand and from Japan to the Middle East and parts of Africa. Encompass will support TM with the satellite capacity and distribution, enabling the largest number of viewers across the Asia-Pacific to enjoy coverage of the opening ceremony, 405 events and 38 games until the closing on August 30th. Rajiv Sansanwal, Vice President, Sales – Asia of Encompass said that Encompass is delighted to expand their working relationship with TM and AsiaSat, providing the satellite distribution for the SEA Games, and that with a combined population of more than 647 million people of diverse language and culture, the SEA Games provide a platform for the Southeast Asia nations and its people to come together as one, to celebrate in this multi-sport spectacle. Encompass is honored to be part of this event. Barrie Woolston, Chief Commercial Officer of AsiaSat commented that with their extensive experience of delivering top quality live sports coverage, and Encompass’s unrivalled satellite distribution services, they are confident that AsiaSat 5 will once again demonstrate its leading role as Asia’s prime Occasional Use platform, to provide a fantastic viewing experience of this spectacular sports event to Asian viewers.